After spending an hour or so pouring over the different timelines we have in the classroom and consulting the Internet, they came up with a list of scenes that particularly interested them. It was wonderful to watch the excitement they brought to this work, and their willingness to answer the questions arising from their explorations: “Are the Huns and the Mongols the same people?” “Who are the Tartars, anyway?” They also took time to compare what was happening in China versus other parts of the world, and were amazed to realize how ancient Chinese civilization truly is. Once the list of scenes was established, the students organized themselves and divided up the work - different students would be responsible for researching and writing up different scenes. It was truly fascinating to observe the enthusiasm the students brought to this project - it goes to show how exciting history can be to students when they are allowed to explore it in a manner that is developmentally appropriate! The students’ initiative and ability to organize themselves efficiently and easily clearly reflects the years of practice they had working on projects in Elementary. We look forward to seeing their scripts! 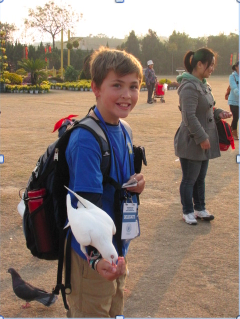 Read about our visit to Longmen Grottoes and the Shaolin Temple. 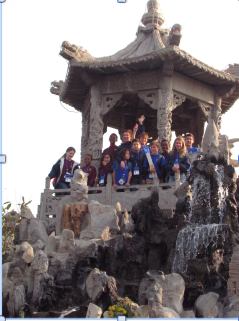 Read about our upper elementary and middle school students visit to Kaifeng City. Our China trip also took us to Luòyáng where we visited the Longmen Grottoes (which literally means “Dragon’s Gate”). This consists of a series of caves, dug out by hand, which houses tens of thousands of statues of Buddha and his disciples. It was amazing to see cave after cave of statues, some as small as 1 inch, and others much, much larger. In fact, the biggest statue stands 57 feet tall! Albert, our guide, explained how we could distinguish the statues of the Northern Wei Dynasty from those from the Tang Dynasty. A favorite moment for many of us was when we climbed the steep steps up towards the largest Buddha. We were told that the center aisle was reserved specifically for the emperor and that, in taking that path, we were walking in the emperor’s footsteps! After walking back to the bus along the Yi River (it was very beautiful! ), we ate another hearty meal...sometimes it seems like the food never stops coming! 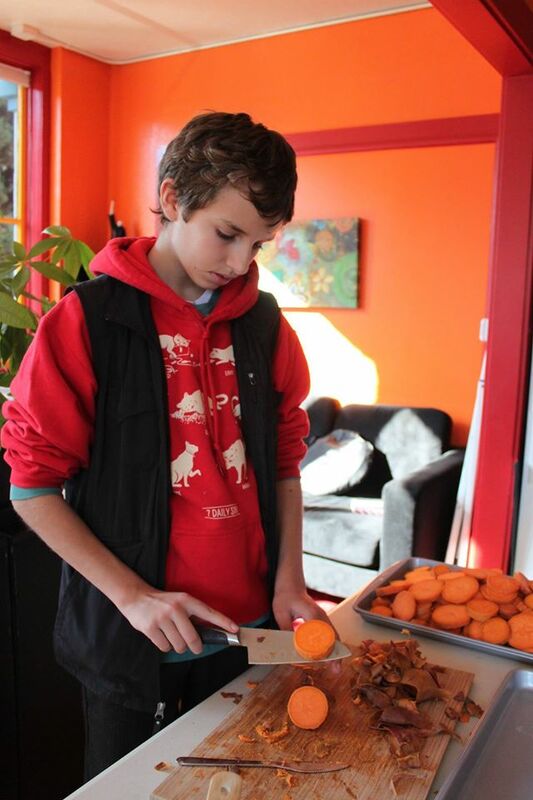 It has been a pleasure to see the students’ sense of adventure in trying new foods! After lunch, we drove to the Shaolin Temple. Here's a fun group shot of us. Upon arrival, we had the pleasure of watching a demonstration of Shaolin Kung Fu. The students were very impressed with the feats they performed, which included poking a pin through a sheet of glass and popping a balloon! On our way out, we observed small children practicing Kung Fu. Our students were very impressed with their agility. From there, we toured the Temple itself. We learned about how Buddhism came to China from India, leading to the construction of the Shaolin Temple about 1,500 years ago. It is remarkable to note that, even though the Temple has Buddhist origins, it is a place where three different belief systems (Buddhism, Confucianism and Taoism) co-exist peacefully. As we walked around the Temple and explored its different courtyards, we all noticed the peacefulness of our surroundings – even when it was full of other tourists! The students were very interested to see the monks and imagine their life in the monastery. We ended our visit with a sunset walk back to the Pagoda Forest and the buses. Our guide was very pleased to see us, as we apparently tool a little longer than planned. As he remarked, “Lord Buddha was playing a trick on you - he wanted you to stay!” Many students commented that this moment was their favorite of the trip so far, as it was so beautiful and peaceful! During our trip to China, following our participation in the Montessori Model UN, we visited Kaifeng City, one of the eight ancient capitals of China. It was particularly interesting to learn that Kaifeng had been the capital during the Northern Song Dynasty, which we learned was one of the most prosperous and stable dynasties in Chinese history. On the way to Kaifeng City, our tour guide, Albert, spoke to us about life in China – both today and in Kaifeng City during the Song Dynasty. Our students were taken aback to hear that Chinese students preparing for the entrance exams to university spend their last year of high school studying from 5 a.m. to midnight, with only a few breaks for meals! Albert also taught us how to say certain phrases in Chinese and sang some traditional songs to us! We started our day at the Millennium City Park, a reconstruction of Kaifeng during the Song Dynasty which was based off of a twelfth century painting by Zhang Zeduan of 'The Qingming Festival by the Riverside' (depicting life at the time). It was great fun to walk around the park, as everywhere people were dressed in the traditional garb of the time. There were also a number of little performances allowing us to get a sense of what life at the time was like. We ate lunch at a famous restaurant where we were treated to an incredible spread! Everyone was enthusiastic about trying new things! After lunch, we took a tour of the Memorial Temple of Lord Bao. Lord Bao is a Chinese hero from the Song Dynasty. He was an official who fought courageously and unyieldingly against corrupt officials and protected ordinary people from being exploited. Our guide explained Lord Bao's story and showed us around this special temple. It was a beautiful and peaceful spot! 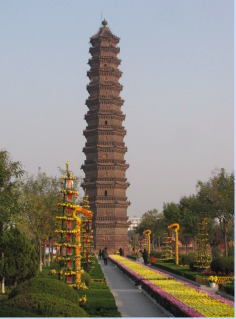 We then went to the Iron Pagoda, a 13-story pagoda built during the Song Dynasty. Although the pagoda is actually built of brick, it appears to be made of iron from a distance (because of the color of the bricks). Three of our students braved the climb to the top with teacher, Emily as the rest of the group spent time at a nearby playground...where they discovered some very friendly pigeons! 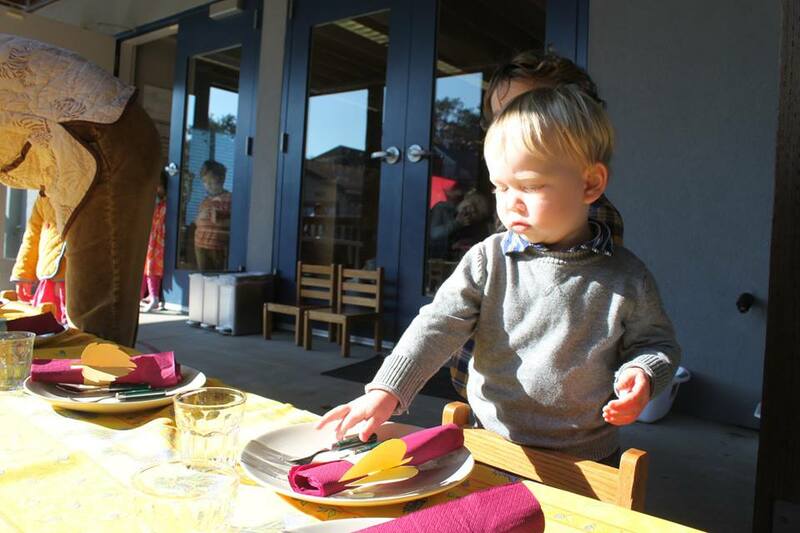 Although Thanksgiving was last week, it's still a big topic of conversation at The Renaissance International School, because our Thanksgiving Feast is always one of the best days of the entire year. Everyone at school - from the shortest to the tallest - is involved in preparing for this special day. A month or so before the event, teachers and staff are already meeting to plan and taking inventory of supplies. Do we have enough plates? silverware? napkins? Students then start to create table decorations and name cards in their art classes. Some of the oldest students in the school create a seating chart as soon as the RSVPs begin to trickle in. They first determine how many tables are needed and then work at assigning each person to a table. This process is incredibly complicated! The students first need to solicit information from teachers about allergies and dietary restrictions, students with particular need of support, etc. 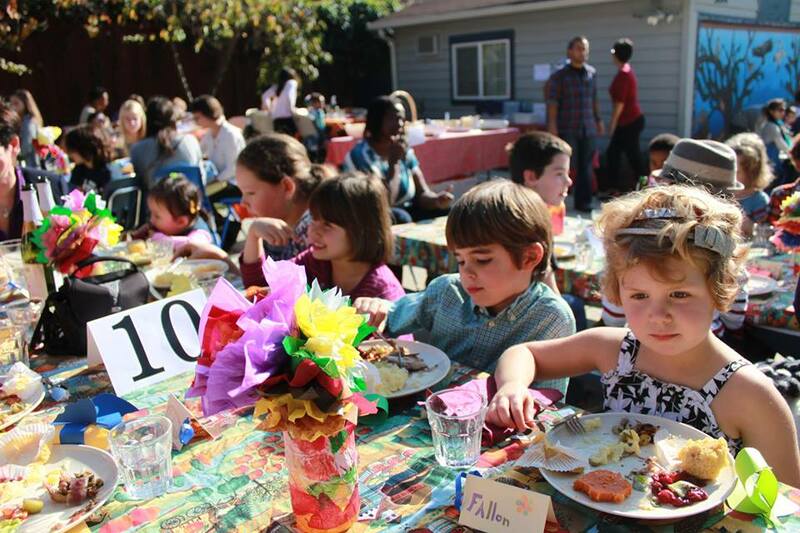 They then work to fill each table with a balanced mix of students and adults from all classrooms and school environments, respecting the particular needs of each child so that everyone present is supported in having a successful experience on the day of the feast. What a task! The week of the feast, each classroom organizes shopping trips to purchase supplies and then spends many hours cooking. It takes a long time to cook for 200 or so people! The day of the feast, the last items are cooked as Upper Elementary students set up for the feast outside. 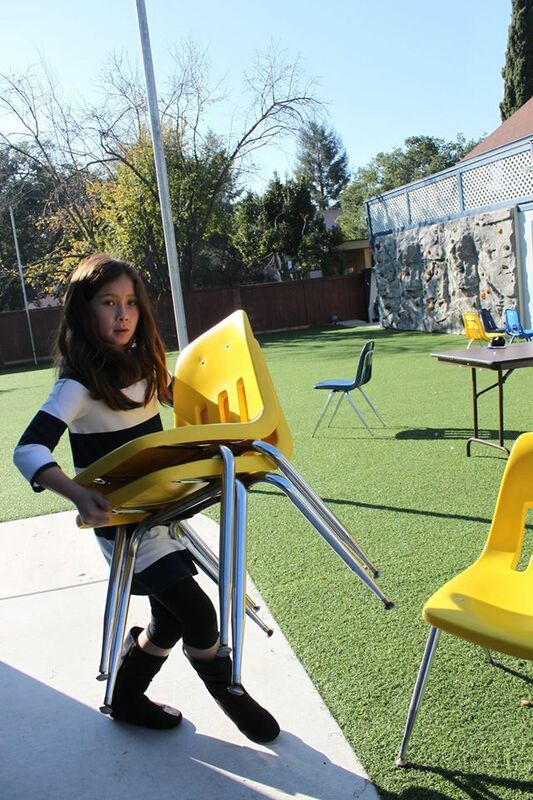 Tables and chairs are carried into the yard and table cloths spread. Each spot is laid out with care, pitchers of water served, and cleaning stations set up. At just about 11:30am, the food starts arriving - mounds and mounds of delicious-smelling items! By noon, all the students are lining up so that they can enter the feast. This year, we were lucky enough to be joined by a dozen alumni who had come back to visit! As each table is called, they walk by one of the serving tables so that all the students can see the fruits of all their hard work. Finally, the whole community is seated, adults help to serve the food, and we all eat together. Table conversation focuses on what we are thankful for. A sense of peace and togetherness settles on all gathered. After enjoying all of the different dishes that had been prepared (including pie! 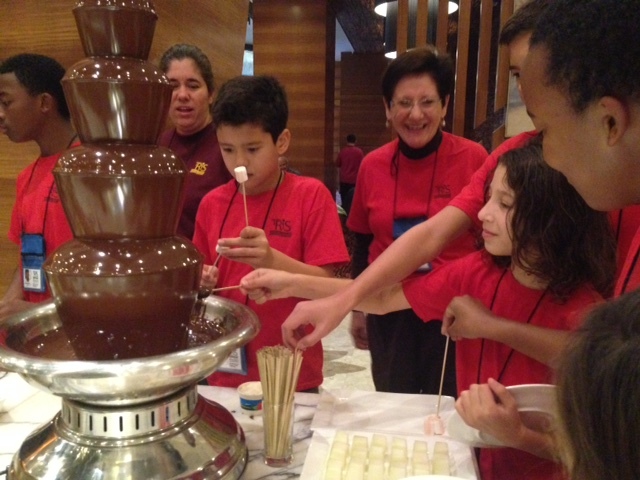 ), students and adults work together to clean up the whole event. What a marvelous community affair! 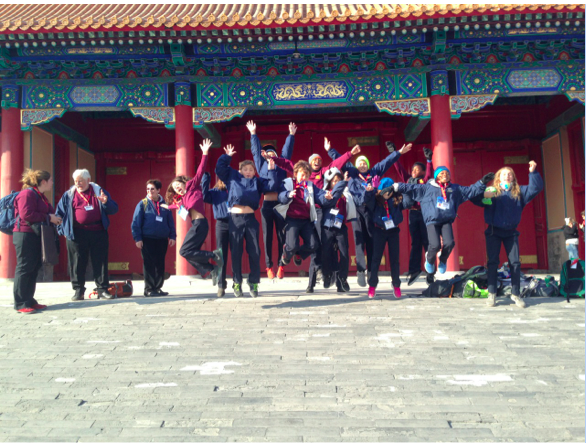 The Renaissance International School's upper elementary and middle school students traveled to Zhengzhou, China in November. The journey was long and everyone was happy to arrive at our lovely hotel where we all enjoyed a good night's rest. After sleeping in and enjoying our very comfortable rooms, we were amazed by the brunch buffet. It offered an eclectic meal that we feasted on. 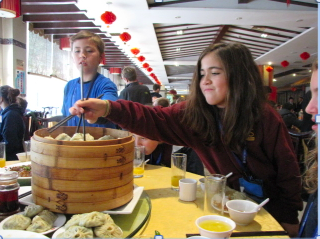 The food ranged from more traditional Chinese menu options of noodles,buns, and stir fried dishes...to snails, crayfish, dragon fruit, sushi, and the very appreciated chocolate fountain. After lunch we completed our official registration and received our official delegate packages. The students were very impressed by the delegate cards with their names and country flags printed on them. We took a short stroll outside to a nearby botanical garden and stretched our legs. The garden was very tranquil and beautiful. We ate an early dinner and got dressed in our formal wear for the Opening Ceremony at the conference center. The ceremony was led by the executive director of the MMUN, Judith Cunningham. We heard from local Zhengzhou elected officials, a former NFL football player, and an ambassador from Sri Lanka. It was an exciting day, and we were looking forward to the next day of committee debates.